Turnerville: Happy Six Month Birthday, Christian! Happy Six Month Birthday, Christian! 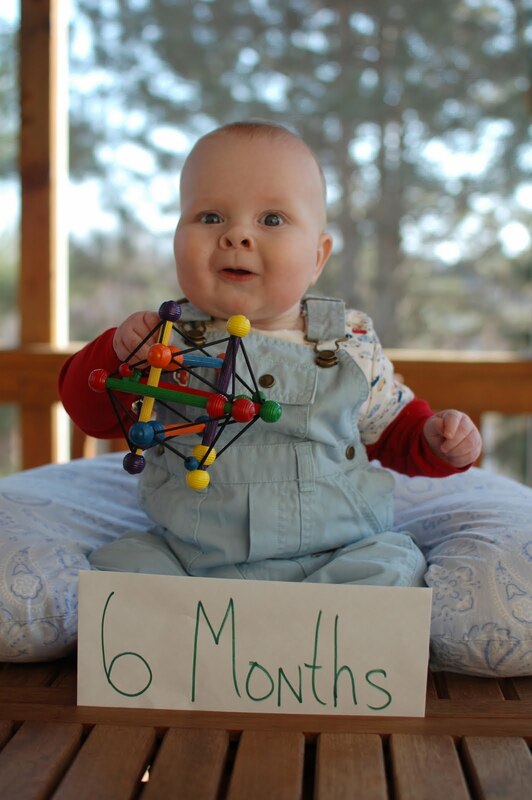 Six month statistics: Weight: 18 lbs. 12 ounces Length: TBD inches. Diaper Size: 3 Clothes: 9-12 months. Last month the phrase of the month was maintaining the status quo. This month the word is sick – icky, icky sick! You were diagnosed with RSV about three weeks ago, and it seems like we have been in the pediatrician’s office two – three times per week since. RSV is a viral respiratory infection that caused you to have horrible wheezing. It also then contributed to a double ear infection. To help you breathe easier, we gave you nebulizer treatments every four hours around the clock for over a week. You also had oral steroids and antibiotics. When the ear infection didn’t get any better – in fact, it got worse – they gave you a stronger antibiotic, which wrecked havoc on your poor tummy. The past four nights you have been up from approximately midnight – four am crying your heart out. Your dad and I take turns walking, patting, rocking, singing, anything we can think of. The sleep deprivation is really getting to us. We took you back to the pediatrician on Saturday and she prescribed a new antibiotic that should be easier on your stomach. We also started probiotics again. I have my fingers crossed that tonight is better! We hate seeing you so sick. In addition to getting RSV yourself, you were kind enough to pass it along to grandma. She has also not been feeling well. Luckily, you were done with the nebulizer just as she started to need it. She had an x-ray and on Friday and seems to already be feeling much better. In the past two days you have started sitting up on your own. You are pretty wobbly, but it is great to see you hit this important milestone. A few days ago you also rolled from front to back. I even got it on video! You don’t much like being on your stomach so perhaps that is what motivated you to roll. No sign yet of rolling from back to front. Now that you can sit up a little, you love to sit on your play mat and swat at your toys. Speaking of toys, you are so interested in them now. Dad pulled some of your brother’s old toys out for you to play with. It is amazing to see you so engaged with them. We also give you a spoon to hold and play with. In addition to toys and spoons, you have found your feet! It is adorable to watch you grab at them. Speaking of spoons, it is time for solid foods. This morning I gave you a little tiny bit of banana on my finger. You weren’t quite sure what to make of it and promptly pushed it right back out of your mouth. Tonight, we gave you a little bit of rice cereal for the first time. You seemed to really like it! Of course, you had a bunch of it in your neck when I got you ready for bed, but I think that goes with the territory when first starting solids. I checked a book out from the library called, Baby Love, a collection of recipes for first baby foods. I’m excited to start making some delicious foods for you. It is hard to talk about any kind of schedule for the past month since you have been so sick. You have not been sleeping well at night since the wheezing got bad. I think at a minimum you are up two times each night, and you are having lots of trouble going back to sleep. During the day you are taking naps, but only when we swaddle you and then walk with you for 7 – 20 minutes. Most of that time you are crying. Once you calm down and fall asleep, we place you in your crib. You are still a fan of the 28-minute nap, but we have had a few longer naps. Sunday, for instance, you slept over two hours. I’m not sure if this will happen on any kind of regular basis, or it is just all the medication you are on. Well my little one, it is nine o’clock at night and you have just woken up crying already. Your dad is up with you, but I better go check on you both to see how you are doing. Your dad and I are really tired, Christian. If you could help us out in the sleep department it would be greatly appreciated.